St Cyprian's Church originally opened as a district mission church in the parish of St Agnes, Burmantofts on the 3rd October, 1903. The first building was a wooden hut on brick foundations. The congregation at St Cyprian's was enlarged when St James's Church at Cross York Street, Leeds, was closed in February, 1949. 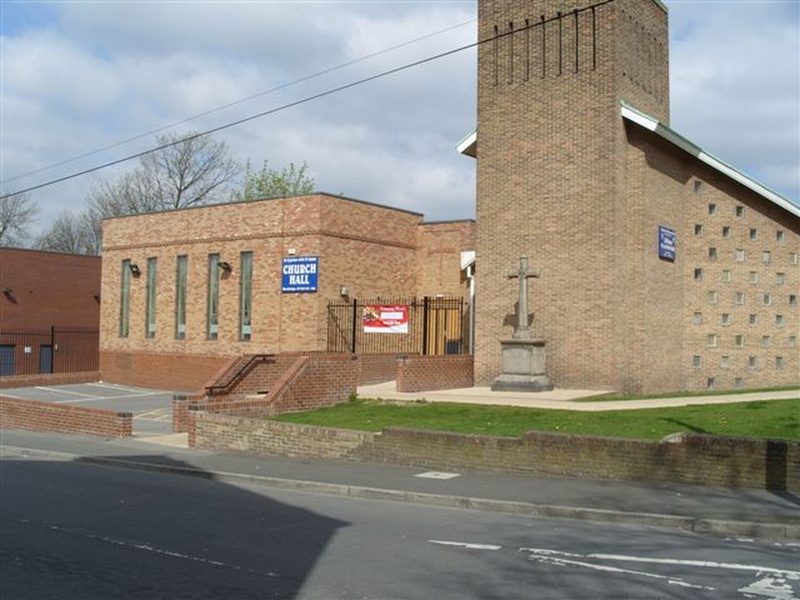 The new parish of St Cyprian with St James, Harehills, was formed in April, 1959, although marriages had been licensed from 1950. The temporary church was replaced by the new brick St Cyprian with St James in 1959. Links with the old St James's Church were retained with the Abbot and Smith organ, pulpit, communion table, lectern and the Bishop's chair in the Sanctuary. The church was built on a raft to avoid possible effects from mining subsidence. Support work had to be carried out some years ago to supplement the foundations following a very prolonged period of dry weather. The choir stalls are made from pine held by tubular steel and the church walls are of buff coloured brick. The east wall (there is no traditional chancel) is a brick design and has a large suspended Cross (made of stainless steel) depicting the risen Christ. The walls of the nave are splayed and increase in height from west to the east, emphasizing the sanctuary, and the whole church is light and airy. The lasting impression of the spacious interior is of the brightly coloured glass of the long nave window slits and the sanctuary glass with dominant blue and red colours. At best seen inside on warm, summer mornings with the sun shining through the south side sanctuary windows and from outside on cold, crisp, winter evenings with all the lights on inside the church proclaiming the message 'Jesus Christ is the Light of the World'. In 2007 a new church hall was built alongside and connected to the Church . It was dedicated by James, Bishop of Knaresborough. The hall is available for private bookings - see details on the site. The main link from Church to Hall is through the area formerly occupied by the Baptistry. The stained glass widow of the Baptistry was turned 90 degrees and now greets anyone entering through the Hall entrance with brightness, light and colour. In 2016 the church became part of a United Benefice with St Agnes, Burmantofts.